When the Minnesota Supreme Court decided to upgrade their courtrooms, they looked to Minneapolis-based audiovisual integrator, MSpace, to integrate Vaddio camera systems into Courtroom 300. Courtroom 300 is the larger of two courtrooms used in the Minnesota Supreme Court for video recording/streaming all sessions to the Internet and local public television station, KTCA in St. Paul. MSpace upgraded the court’s video system with the Vaddio ProductionVIEW FX switcher and three WallVIEW PRO 300 PTZ camera systems. It’s not surprising that courthouses are struggling to achieve more, or at least stay on top of things, with fewer resources. Over the last couple of years, courts have undergone considerable cost-cutting measures, especially when it comes to personnel. Larry Heilman, president of the Topeka, KS-based systems integration firm Smith Audio Visual, recounts that some states have cut their court budgets by as much as 20 to 30 percent, targeting clerks, assistants, and court reporters. “In many cases, the court reporters are retiring, and they’re not getting people to replace them,” he said. Court construction is down both at the federal and state levels, and many facilities close their doors for one business day a week to control expenses. Heilman noted that this is particularly common in the civil arena. Video systems also respond to the need to drive cases through with fewer employees. For example, it’s much more cost-effective if a defendant’s first court appearance is conducted via videoconference. “They can put them into a room with an officer, and that officer does not have to transport them,” Heilman said. This is especially practical when the distance between the detention center and the court is great. “In many cases, they will have to drive up to an hour-and-a-half, one way, from the housing and back, a three-hour round trip just to get the defendant in front of the judge for a five-minute appearance,” Heilman illustrated. “We ask: ‘What are your costs for man hours and expenses related to travel?’” Oftentimes, he added, the ROI on a basic desktop videoconferencing system is achieved in the equivalent of three trips. In the audio realm, courts are now requiring that the sound from each microphone in the room be recorded on a separate channel. “There is a big increase in the request for multi-track recording in courtrooms rather than just a big MP3 file, for example,” said Barry Luz, systems applications specialist at Bosch Communications Systems. With a large MP3 file, transcription is tedious: When one wants to zero in on, say, just the judge’s microphone, it’s sometimes necessary to listen to an hour of audio between each time the judge speaks. With multi-track recording systems that feature coding to let users know which audio is assigned to which mic, users can go back and listen to any single microphone. At the Johnson County Courts in Olathe, KS, the Judge’s view includes a video conferencing monitor and an AMX touchscreen connected to the customized 1Touch Digital 8-channel audio recording system and AV control system. The courtrooms use videoconferencing integrated by Smith Audio Visual extensively for first appearances from the detention center so prisoners are not transported to the courthouse, saving the county a large amount of money. 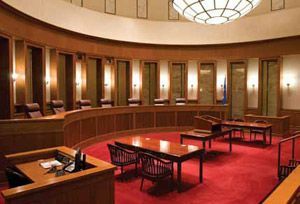 Lectrosonics’ ASPEN Series digital audio processing products were recently deployed in 14 courtrooms in a major Western U.S. Federal Courthouse. Working from a blueprint penned by Spectrum Engineers of Salt Lake City, UT, Michael Bartee (pictured), audio-video systems engineer for Huntsville, AL-based Quantum Technologies was involved in all aspects of the installation, configuration, and programming of Lectrosonics ASPEN Series SPN1624 Digital Matrix Mixer, SPN16i Input Expander, and SPNConference Interface unit in each courtroom.